International Journal of Research in Health Sciences,2015,3,2,274-277. 1-Asstt. Professor, 2-Sr. Professor and HOD, 3-Sr. Demonstrator, Department of Biochemistry, J.L.N.Medical College,Ajmer,Rajasthan, INDIA. Background: The value of serial measurement of serum β subunit of human chorionic gonadotropin (β-HCG) and ultrasonography in the early diagnosis of ectopic pregnancy has well established. Objective: The objective of this study was to explore the diagnostic value of raising level of single measurement of progesterone (P) and serum β-HCG in early diagnosis of ectopic pregnancy. Materials and Methods: Serum levels of progesterone and β-HCG were measured by Radio Immuno Sorbent Assay (RIA) technique in 100 symptomatic women with ectopic pregnancy and 100 women with normal intrauterine pregnancy in the wards of Rajkiya mahila Chikitsalya, J.L.N. Medical College and Associated Group of Hospitals, Ajmer, after taking approval from ethical committee.. These values were compared by T-test. By determining cut-off levels of these parameters the sensitivity and specificity of them in prediction of ectopic pregnancy was estimated. Results: The mean serum levels of progesterone and β-HCG in patients with ectopic pregnancy (5.86±1.18 ng/ml and 511.7±245.5mIU/ml) were significantly lower than in women with normal intrauterine pregnancy (23.5±7.38 ng/ml, 1903.0±425.5 mIU/ml, respectively) (p<0.001).Conclusions: In this study single measurement of serum progesterone level has the greatest sensitivity (99%) and specificity (100%) in the diagnosis of ectopic pregnancy. 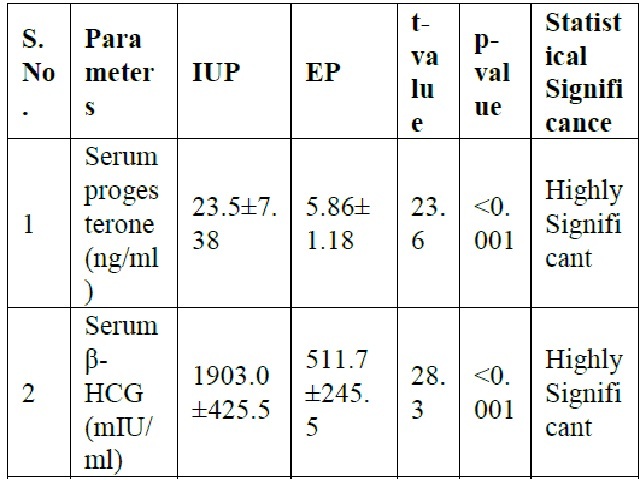 Mean serum progesterone and β-human chorionic gonadotropin values in normal IUP and EP.